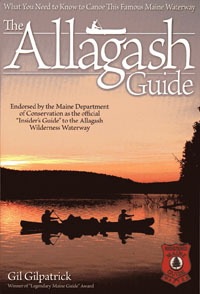 Endorsed by the Maine Department of Conservation as the official "Insider's Guide" to the Allagash Wilderness Waterway. If you are thinking about taking an Allagash canoe trip The Allagash Guide is for you. You will find information about what to take, how much time you will need, where to start, what to do about your vehicle, campsites and much, much more. You will start your first trip with information that would take years to accumulate on your own. The equipment and food lists in the book are extensive and will allow you to make up your own lists with the confidence that nothing needed will be left behind. The lists evolved over many years and will cover a variety of tripping situations. This book, along with Gil's book Allagash, will make you an Allagash expert the first time out.